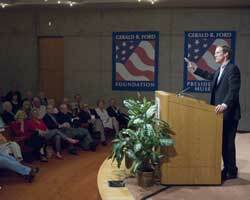 Richard Norton Smith speaks to a capacity audience in the Ford Museum's Auditorium. 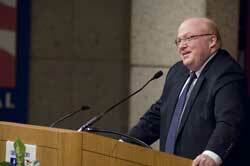 Mike Ford introduces the 2008 Simon Lecture by Richard Norton Smith. On stage after the 2008 Simon Lecture. 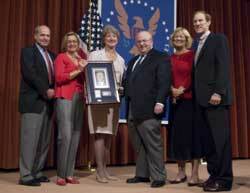 From left: Vaden Bales, Susan Ford Bales, Museum Director Elaine Didier, Richard Norton Smith, Gayle Ford, Mike Ford.